and Clyde Valley region in West Central Scotland. Glasgow, home to 600,000 inhabitants, is Scotland’s largest city in terms of size and population. With a metropolitan area of more than 2 million, Glasgow is one of the UK’s most important commercial centres and has a longstanding history of trade, industry and commerce, from farming in the Middle Ages to the mercantile era of the Tobacco Lords in the 18th Century right up to the present day. Glasgow is one of the world’s most vibrant, cosmopolitan and friendliest cities and welcomes over 3 million visitors annually, drawn to the city by its wealth of cultural events, festivals and attractions. 2014 marks a special year for Glasgow, host city for the 2014 Commonwealth Games with most of the action being staged in the East End, close to Tartan Lodge. 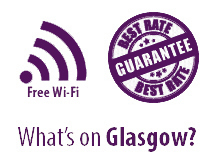 Besides the Commonwealth Games, there are many other reasons to visit Glasgow, dubbed ‘The Friendly City’. Glasgow plays host to an eclectic range of events and festivals throughout the year, from the World Pipe Band Championships in Glasgow Green in August to Celtic Connections in January, the world’s largest Celtic Music Festival. You do not have to venture far to discover why Glasgow is the UK’s premier shopping destination outside London. Designer boutiques aplenty like Hugo Boss and Versace are in town on the edge of the Merchant City and one can indulge in a special purchase in the numerous outlets and department stores in the pedestrianised shopping thoroughfares of Buchanan Street and Argyle Street. Head to King Street, Parnie Street and the West End to pick up a bargain in one of the quirky, independent boutiques or vintage clothing shops. Whether you are visiting Glasgow for business or pleasure, you will be captivated by the architecture this vibrant city has to offer. From medieval treasures like the Tron Steeple and The Tolbooth in Glasgow Cross to Charles Rennie Mackintosh’s Art Nouveau collection of buildings dotted around the city such as Glasgow School of Art, it is hardly surprising that the city was awarded the UK City of Architecture and Design in 1999. Boasting first-class sport and leisure facilities, an eclectic range of pubs and venues and the most vibrant nightlife that Scotland has to offer, Glasgow is aptly described by Lonely Planet as ‘Scotland at its artsy, riotous, high-octane, good-time best’.